What is it that makes someone want to sail alone and nonstop around the world? I’m just an average guy from Petosky, Michigan, who learned to sail on his dad’s Hobie 16. When I first started sailing offshore in my 20s, mostly working as crew on delivery trips, I found the same books aboard many of the boats, written by such great sailors as Bernard Moitessier, Francis Chichester, Robin Knox-Johnston, Joshua Slocum and Miles Smeeton. I was spellbound by what I considered these truly great sailors and the adventures they’d had. They set my imagination ablaze with thoughts of sailing in the high latitudes and in the Southern Ocean. I was hooked from the first time I read about the 1968 Golden Globe Race, and as most sailors do, I wondered what it would be like to make such a voyage. Little did I know that my sailing life would come full circle, that someday I would be writing about my own trip around the world. It was just a dream back then, and I thought I had little chance of actually taking on my own circumnavigation. It wasn’t until I started working as head watersports instructor at the Bitter End Yacht Club in the BVI that I thought I might actually make those dreams come true. I saved up for a few years to buy a Westsail 32, a boat with a proven track record of seaworthiness and one that was within my means to adapt to a challenging solo circumnavigation (see Boat Modifications below). I also did a few solo trips out of Florida and the BVI, and took her north to Maine by myself in early 2017. By the time I arrived I’d racked up 9,000 miles on the boat, so I knew her well. 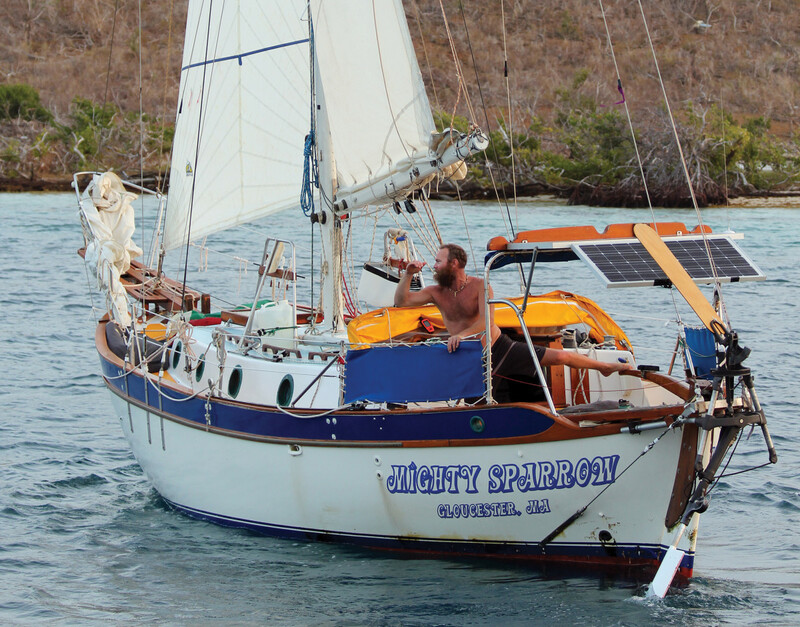 I’d also decided to rename her Mighty Sparrow in honor of the people of the Caribbean, my spiritual home. With the help of my father and brothers, I then spent the following summer working on the boat with an eye toward leaving from Gloucester, Massachusetts, in October. The plan was simple, on paper at least: to circumnavigate solo, unsponsored, unassisted and nonstop via the five great capes—Cape Agulhas (Africa), Cape Leeuwin (Australia), South East Cape (Tasmania), South West Cape (New Zealand) and Cape Horn (Chile). On the day of departure, I remember being so exhausted from all the last-minute preparations I could hardly believe the day had finally come. As relieved as I was to be underway, though, I was also nervous about the possibility of a hurricane developing as I made my way south. Nothing was on the radar between Africa and the Caribbean on the day I left, but October is too soon to consider yourself in the clear, and the season had been a busy one thus far. One of the problems with setting out from the United States on a circumnav is timing. I didn’t want to reach the Southern Ocean before the antipodal summer, which meant leaving in September or October. However, this presented a big problem, as a series of hurricanes had started rolling up from the Caribbean—first Irma, then Maria and Jose. For a few nervous weeks, I watched, waited and wondered if I would even be able to set sail. Then, as Jose fell victim to the cold waters north of the Gulf Stream, it seemed a break in the weather systems had come. The boat was ready, and with as much haste as possible I set out into the North Atlantic. Unfortunately, almost halfway across the last storm of the season formed, and the next thing I knew Ophelia was charging to the north-northeast, right ahead of me. Originally, I’d wanted to get as much easting in as possible to be in a good position to sail off the northeasterly tradewinds, but now I had to sail farther south to avoid the worst of the winds and seas building from the storm. As it was, the edge of Ophelia still clipped me, which made for a good test of the boat. Beating hard into a strong wind and sharp waves, the first casualty was the reefing winch, which was ripped off the boom, forcing me to shift some of the lines to make use of another winch. Then, in the middle of the night, the mainsheet traveler car exploded under the constant load. Fortunately, I had lashed a small piece of Spectra as a safety line and found it holding the entire load of the main. I also had a spare, which I promptly installed. After a few soaking-wet hours on deck, I was able to crawl back below and dry off for the night. Of course, replacing the winch was an even bigger job. Nonetheless, as soon as things had calmed down a few days later I went to work making a backing plate and taking apart the boom to install it. As I pounded away on the boom with a hammer I found I was attracting the interest of a pod of dolphins. The more noise I made, the more interested they became. I still smile now as I think of that day, working away with an audience! After being taken off my planned route, I spent the next 31 days beating hard into the northeast trades to once again get as much easting in as possible before I hit the doldrums, worried I might not even make it around Brazil if the winds didn’t change. As I was doing so, and then later in the doldrums themselves, I was given the royal treatment by light winds and fierce thunderstorms. In the end, it proved to be a ton of work to make it through under sail alone, as I was constantly changing sails in response to the squalls rolling over us, day and night, always wary of getting caught with way too much canvas up. Much later, sailing back through the doldrums headed north, I was once awoken by the sudden, violent heeling of the boat followed by the death rattle of my nylon drifter. Arriving on deck to see what was going on, I could see the sail was shredded. It is always a gamble falling asleep under full sail in the doldrums, but I’d wanted to get home and was getting very good at waking up just minutes before a squall. Alas, my luck had run out, and the loss of that drifter would slow me down for the rest of the voyage. After the doldrums were behind me, I became increasingly worried as I approached South Africa and headed for what I considered the most dangerous cape of all, the Cape of Good Hope. With a powerful counter-current extending well to the south, I knew I would be lucky to skirt by unscathed as the low-pressure systems rolled past, one after the other. The writings of Moitessier warned of the dangers there. I expected rounding the cape would to take a week or so in all. Early on after a short blow, I was becalmed for 24 hours and felt more helpless than ever. This is not a place to hang around for long. As I lay there, the Volvo Ocean Race fleet passed just north of my position. A very large gale was also now coming up from the south with winds expected to exceed 70 knots as it passed overhead. 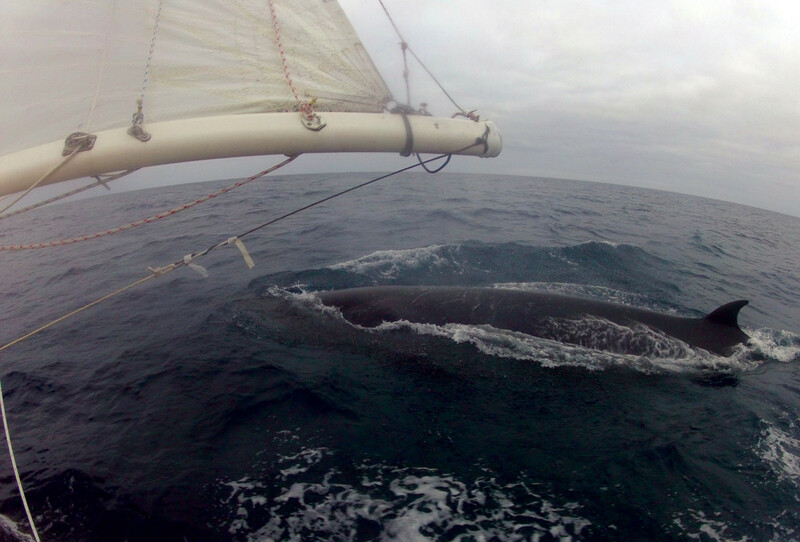 Preparing for the blow, I decided to see how the boat would handle with just the staysail pulling us along. 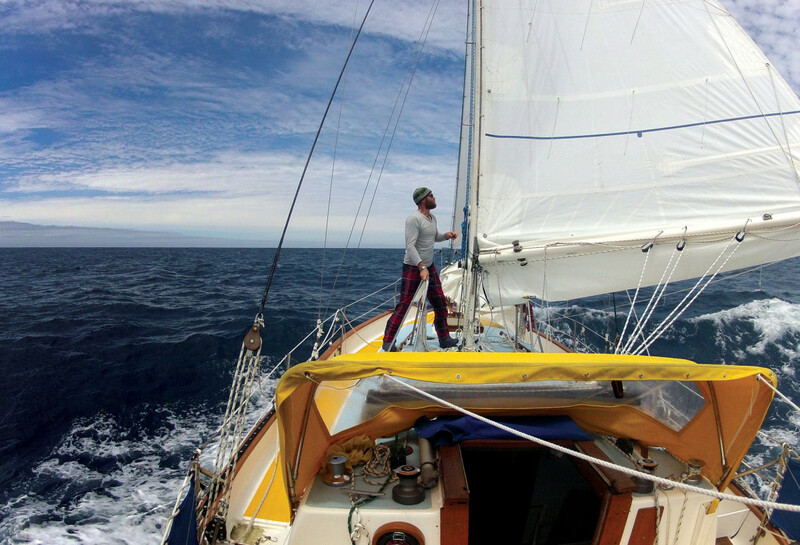 I also doubled up the sheets and lashed the mainsail down tight as the winds started to build. As I was doing so I realized how lucky I had been to be becalmed, since it now appeared the very worst of it would be 120 miles further east. As it was, that night I rode out winds of around 50 knots. The size of the seas and swell was an astounding sight. In the morning I was greeted by a view straight out of a movie—huge hillsides of water, with enough room in between them to build a football stadium. Later, as the winds settled down I set more sail and tried my best to make way with the boat still feeling like a cork at the mercy of the elements. I was happy to have been spared the worst of the winds, but also dreaded what was coming next—the calm that comes after every Southern Ocean storm. Meanwhile, another issue was fast becoming apparent—I was running out of water. I’d planned to sail with 100 gallons of freshwater aboard and catch rain to add to my supply. A good friend of mine had also told me not to be stupid and take an emergency pump just in case, which I did, a small hand-operated PowerSurvivor. Unfortunately, I was a little irresponsible with my water usage, and the rain was almost nonexistent, so by the time I had rounded the Cape of Good Hope I was getting low and had to start using it. Worse yet, after I had made only about 10 gallons the pump exploded, never to work again. So there I was, in mid-ocean with only about 15 gallons of freshwater. All the way across the Indian Ocean the rain never came, and my supply got to be as low as two gallons at one point. Only as I closed in on Australia was I finally able to boost my supply to around 20 gallons in all. Still, water would remain a constant worry right up until the final days of the trip. In early January, my brother Adam messaged me that a storm was building to the north of Australia and was forecast to turn south. He said he would keep an eye on it, but it was going to be close if it followed the forecast track. At that point, I was sailing at about 37 degrees south in calm seas and light winds. As the days passed we all watched and wondered if it would be better to keep moving east and try to pass in front of what was now Cyclone Irving, or whether it would be better to turn west until the storm had passed. As time went on, Irving’s track changed every day, and in the light winds, I began to feel like a sitting duck. At 24 hours out, it looked as though it would pass just ahead, and we would only get clipped by the outer edge of the winds. By then Irving was a much smaller storm, but still had winds above 70 knots in the center. As night fell and the winds began to increase from the north I was reaching with every bit of sail I could safely carry. The waves were still small, and even though they were on the beam, the boat seemed fine and we were moving fast and gaining distance from Irving’s eye. Then, sometime around 0400, I was awoken by what sounded like a truck slamming into the hull. The boat tipped just past 90 degrees, and I soon found myself lying in the leecloth like it was a hammock. Fortunately, Sparrow came up quickly, and before I could even get up on deck, she was sailing again. Still, in the few short hours while I’d slept the waves had almost doubled in size and were now breaking. Wearing nothing but my thermals, I, therefore, reduced sail to just the triple-reefed main and ran off before the wind, spending the next few hours surfing as I’d never done before. In retrospect, the knockdown was all my fault: I had been playing a game with the waves and was lucky to not have damaged the boat any more than I did. As it was, I lost the preventer and tore the grommets out of one of the spray skirts. Lesson learned: I would always keep the seas away from the beam after that! Twelve hundred miles from Cape Horn, I started making my way south to below 50 degrees. As I was doing so the weather changed very quickly, and rain turned to hail and snow. The squalls never seemed to stop and looked more like tornadoes, a white curtain from top to bottom. The work involved in keeping the boat moving in these conditions began taking its toll. I was happy for the distraction but wanted nothing more than to start heading north again. As I made my way east, I checked the weather almost every day, fingers crossed, hoping not to see a massive low. I knew it was a gamble to be rounding in April, but I wasn’t going to turn tail at this point. I always thought of Knox-Johnston saying he didn’t want to let down the “me” that got him that far, and I felt the same. Twenty-four hours out and a southwesterly gale was in the forecast. It was nothing exceptional for Cape Horn, but a good blow nonetheless. That afternoon I spotted a few islands to the north, but with night coming on I knew the only trace of Cape Horn I would see would be a few lights in the distance. Still, I pushed the boat as hard as I dared, trying to keep her moving. I was now flying a triple-reefed mainsail with the staysail, more sail than normal for the conditions, racing toward calm waters for the first time in months. By daybreak, I was rewarded with seas down to a mere 4ft! In all the two days it took to round Cape Horn, two days filled with nervousness, doubt, excitement, fear and, finally, relief. I am actually the second person in my family to have sailed these waters—Captain Albert Rand having sailed around the Horn in the phosphate trade 150 years before me. I like to think that the gale was his doing, both to give me a scare and also help get me round as quickly as possible since winter was very much on its way. On April 8, I finally was able to head north again. About a week after rounding Cape Horn, I realized I would need to have a resupply before too long, as I was down to a diet of lentils, rice and a few packets of chicken stew. Looking at where I was and the dominant weather, the Falkland Islands seemed to be the place to go. I, therefore, had my father arranged for a supply boat to meet me just outside of Port Stanley in the Falklands. The government there was kind enough to allow me to sail in without having to clear customs, much to my relief. The weather was nasty as I approached the islands, and sailing so close to land, sleep was out of the question. All night and all the following day squalls remained very strong and full of hail. I sighted the Port Stanley lighthouse at daybreak and worked my way through a few rock outcrops into the bay. As I rounded the lighthouse and headed toward sheltered water and much less breeze, I could see it was going to be a challenge to make any kind of progress upwind. 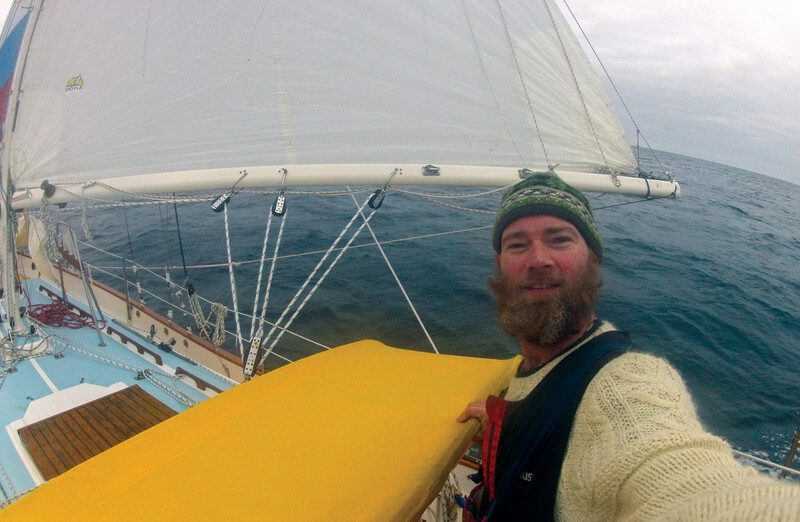 Under a triple-reefed mainsail and storm jib I slowly beat to weather, eventually meeting up with the supply boat. It only took about a minute for the crew to pass over the boxes of food I’d ordered, and in no time I was on my way again, another squall fast approaching in the distance. As I was drifting down the bay and back out to sea, I began rapid-fire unpacking, stowing, eating and taking a few sips from a Scotch bottle! It was so unreal to eat foods I had not tasted in months. Soon the main was set, and I was blasting along no longer protected the calm provided by the islands. After that, the winds came on very strong, and the miles flew by. In the night I had a few ships around, and as the winds died down the next morning, the sun came out and I was able to make some time to sort out the boat and enjoy my first cockpit shower since New Zealand. As I did so, the big shock was my body. I’d started the trip a robust 195lb, but I figured I had now lost almost 50lb. I’d had no idea this was happening, as I never once took off the many layers of clothes I’d been wearing while making my way across the Pacific. One layer was actually covered in mold. I was a living ecosystem! Mostly, though, I was relieved that everything had worked out. The weather could very well have made it impossible to make the Falklands, in which case I would have had to carry on to Brazil. As the miles to Gloucester fell away, I found myself sailing into the fishing fleets south of Cape Cod. With all the AIS alarms, VHF chatter and lights all around, I was not able to sleep for more than a few minutes at a time. I didn’t care, though, as I knew that in only a few days I would be finished. I had a nice little blow as I passed George’s Bank, but was becalmed soon after. After that, the winds were up and down as I tried my best to make those final miles. By noon on Day 270, though, I was sitting 10 miles out from Eastern Point with no sails up, watching lobster boats going about their business. I did get a little gift from a lobster boat named Golden Girl after they came by to check that everything was OK. Upon hearing I had been at sea for so long the first thing they asked was if I needed any food. Yes! They handed over a salad, BBQ chicken breast and some bottled water. I have never eaten so slowly in my life. Every bit of that salad was delicious! 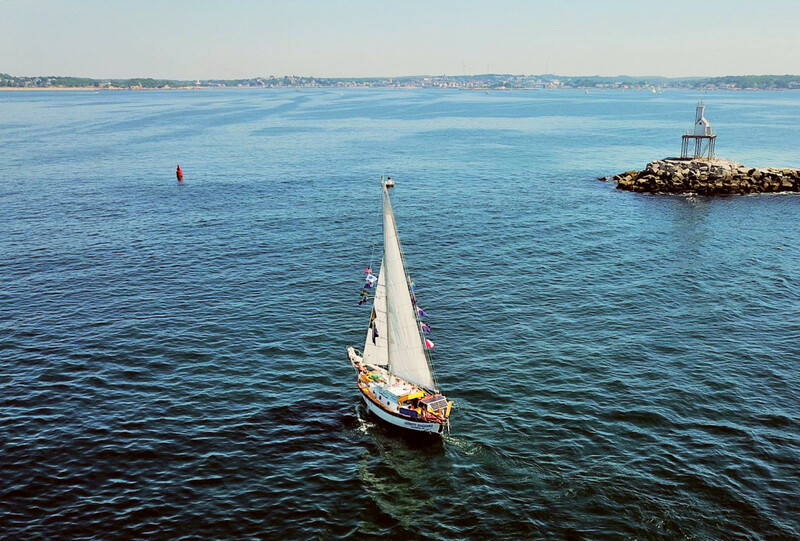 As I made my final approach into Gloucester on the morning of June 30, spectator boats filled with friends and family surrounded Mighty Sparrow. Cannons fired and the Coast Guard escorted our armada to the harbormaster’s dock where, finally, after 29,805 miles and 271 days, I took my first steps on the floating dock, my the adventure was officially over. That night I slept on the boat, not yet wanting to get too far away from Sparrow. Later, after some TLC in Maine, I sailed her to the islands where she is now anchored in North Sound, off where the Bitter End Yacht Club is to be rebuilt. One of the reasons for choosing the Westsail was the amount of information available from many sailors from around the world. My major concerns were the stories of rigs lost when the boats were rolled in heavy weather. Specifically, there seemed to be a problem with the boomkin and its anchor points in the hull, so I had new, stronger fittings made, beefed up at the standing rigging and added a second backstay. Belowdecks I decided to fill some of the void in the large cabin and make a storage unit that would hold up under the conditions in the Southern Ocean. The saloon is huge for a 32ft boat and when getting tossed around in heavy weather it can be a big fall from one side to the other. I, therefore, decided to make one side a permanent bunk and give over the other side to storage from the cabin sole to the ceiling. With a little help from a friend we knocked out the shelves in marine ply, painted them and added a handhold. At first, it was a little claustrophobic, but I had doubled the amount of storage space and filled much of the void. All the stores and tools were placed in plastic bins that fit into the shelves and were kept in place with shock cords for easy access. Because of my small budget, I could only afford to have a new mainsail and staysail made for the trip. Constructed of 8oz. Dacron by my sailmaker brother and both over-built, they would be the powerhouse that took me around without ever needing any repairs. The staysail lived on the foredeck the entire trip and only suffered from rubbing against the nonskid where it was lashed down. I believe they could go around again without much trouble. The rest of the sails were all bought used. Some worked better than others. The complete set included a traditional spinnaker, asymmetrical spinnaker, large nylon drifter, small Dacron drifter, #1, #2 and #3 jibs, a spare staysail, two spare mainsails and two very small storm jibs. All the headsails were hanked on. I didn’t take a trysail, as I had a very deep third reef put in the mainsail instead. I believe spending less time on deck in bad weather is safer than trying to rig a trysail. Sparrow has an Aries windvane steering gear. Power was provided by a pair of solar panels and navigation was by sextant and tables and an old chartplotter. We installed a VHF radio and AIS for safety and used a Garmin InReach for satellite communications.